Neither mom nor I needed our alarms to wake us up. It was about 6am and we were already awake from the light of the day and some of the chirping from the early birds. After a quick breakfast of instant noodles using the handy little MSR Pocket Rocket stove, we were ready to take on the day. 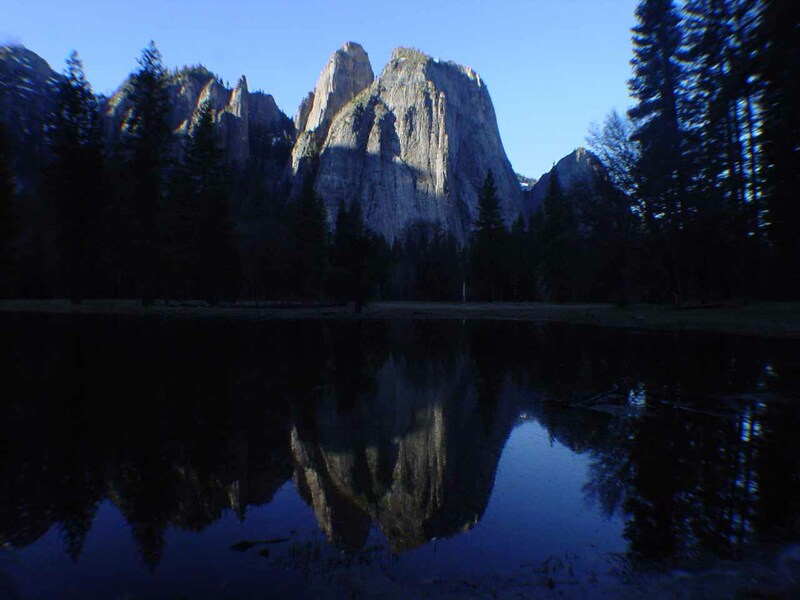 We started off by heading towards a spot where our Photographer’s Guide to Yosemite said we could get good morning shots of the Cathedral Rocks. There was a standing pool here that reflected the attractive rocks. 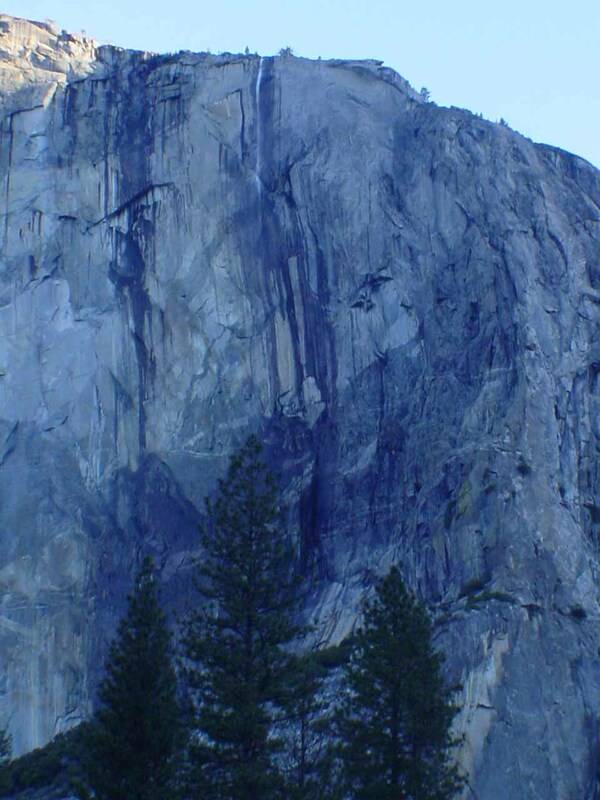 However, we also noticed that we could get direct views of the tiny Horsetail Falls. 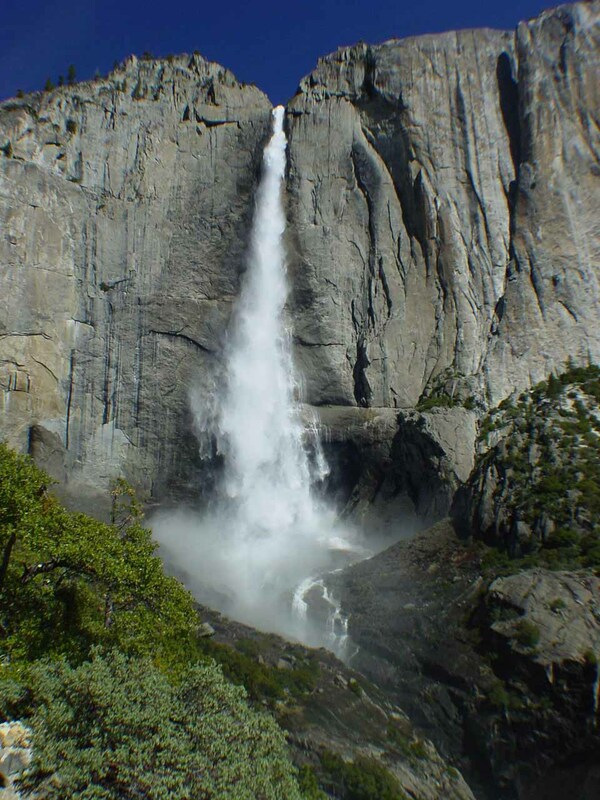 In a bit of a revelation, we could see how this falls looked real wimpy from this angle, and that this was really one of those falls where perspective meant everything. After having our fill of these intriguing photo stops, we then swung around and stopped at a spot known as Swinging Bridge. 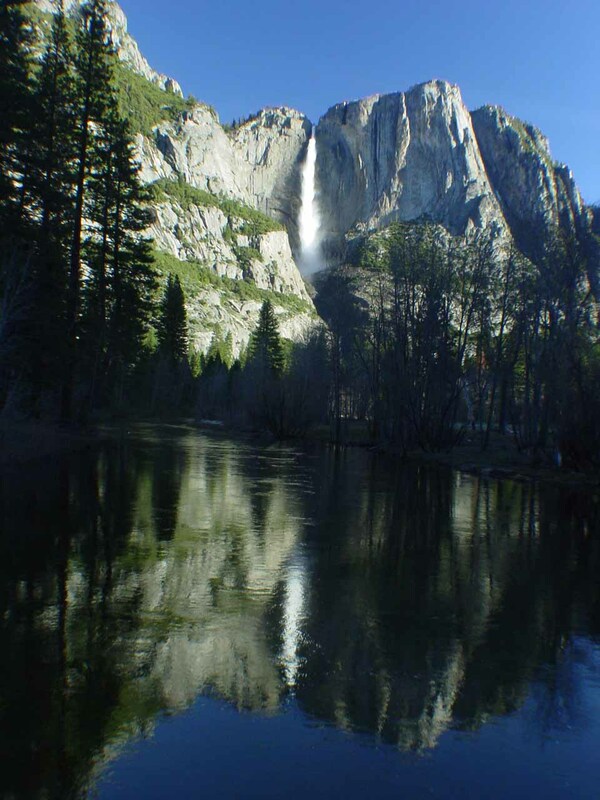 Now there wasn’t a swinging bridge here (instead, it was sturdy), but we did see an attractive Yosemite Falls reflected in the calm Merced River beneath us. 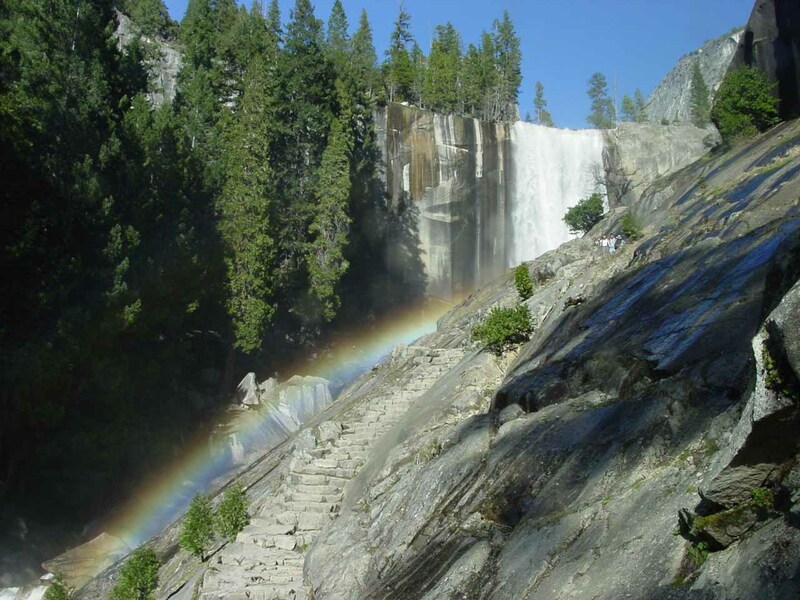 After having our fill of Swinging Bridge, we then headed over to Stoneman Meadow as we were looking for rainbows on Yosemite Falls. It turned out that we did get a somewhat distant view of the falls with a partial rainbow going across it, but it wasn’t anything terribly special. So Mom and I then looked for parking around the Yosemite Lodge area as we were intending to hike to the top of Yosemite Falls. By 9:30am, we were ready to take on the Upper Yosemite Falls Trail. It was unusual not to see any snow in neither the Valley nor the High Country (at least from what I could tell) this time of year. 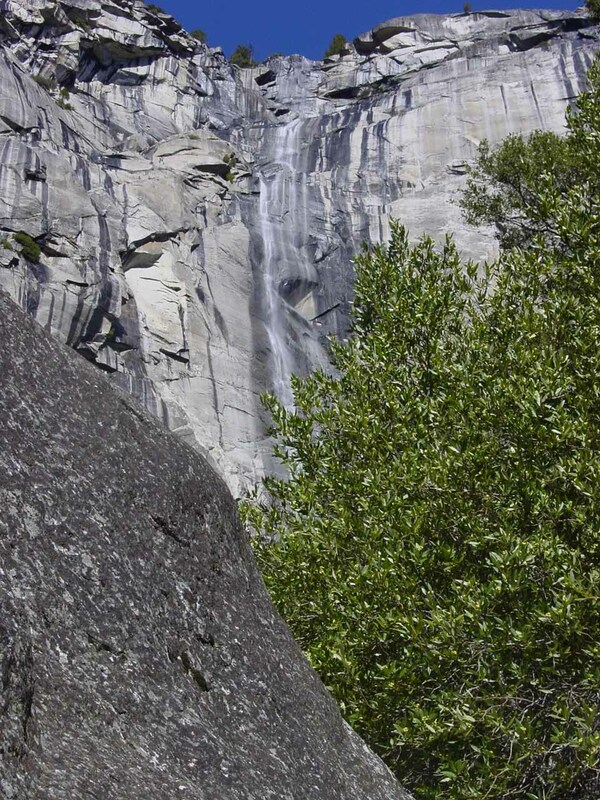 We did notice another ephemeral waterfall as we were looking for the actual trail from the Camp 4 area. 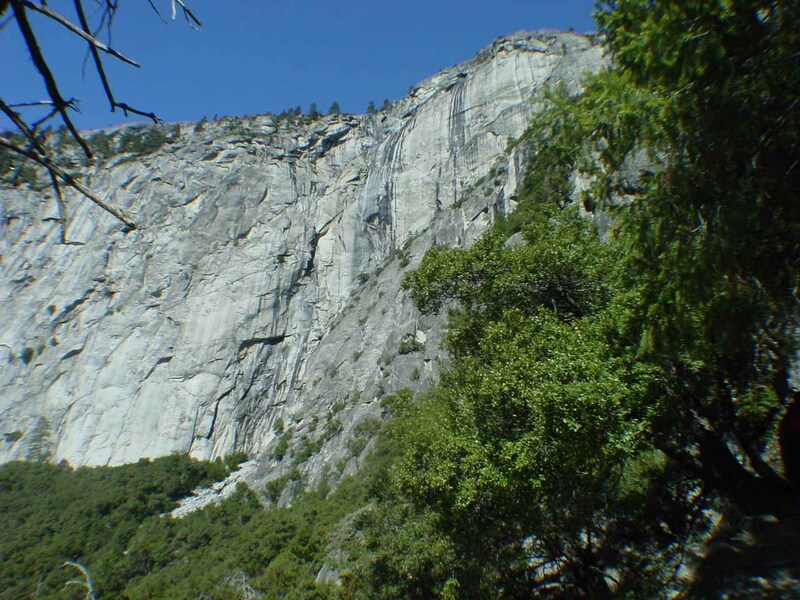 In a way, it kind of kept our attention off of the fairly featureless first 3/4-mile of climbing on the Yosemite Falls Trail. Indeed, the uphill climb was pretty relentless. 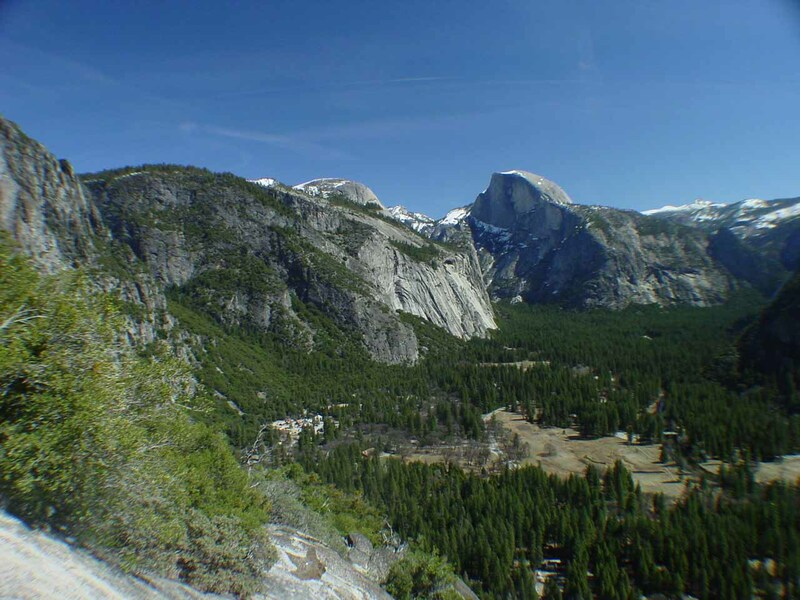 We still saw ephemeral waterfall almost until we made it to the next major landmark, which happened to be Columbia Point – where we could see Half Dome hovering over Yosemite Village. It was at that time that I thought I saw a face and voice I recognized as Mom and I passed by a group of hikers also resting near Columbia Point. It kind of nagged at me, but at the same time I didn’t want to make a fool of myself so we continued on the trail. The next section of trail was brutal. We had to go up more switchbacks, but it was sandy. With each step we took, our foot with slide a little bit. This made us have to work harder on each step to make the same progress we would’ve made had the surface been harder. When we finally got to the top of these tiring switchbacks, both Mom and I took another water break. It was at that time that the hiking party that we passed earlier caught up to us. As they were passing, I had to get another look at that guy I could’ve sworn I know from somewhere. At first he was shocked, but then he started to notice my facial features beneath my funky hiking hat, and that familiar look of recognition started to take over. Remy was a coworker who would often talk about travel and nature with me when we’d see each other at the office. As we exchanged pleasantries, I got to meet his wife Katrina and both of them got to meet my Mom. It was one of those moments where work produced both a frustrating yet cool moment. Frustrating in the sense that out of what I perceived as corporate greed, I had to take a forced vacation – though Yosemite wasn’t a bad place to be on a last minute trip. At the same time, I got to unexpectedly see a familiar face in a special place. Well Mom and I weren’t about to keep them from getting to Yosemite Point, which Remy said was their goal of the hike, which was a little further from the top of Yosemite Falls. Mom and I probably weren’t as strong hikers as they were, and they had a couple of friends go with them so we certainly didn’t want to foil their time together. And so they moved on while Mom and I went about our leisurely pace. 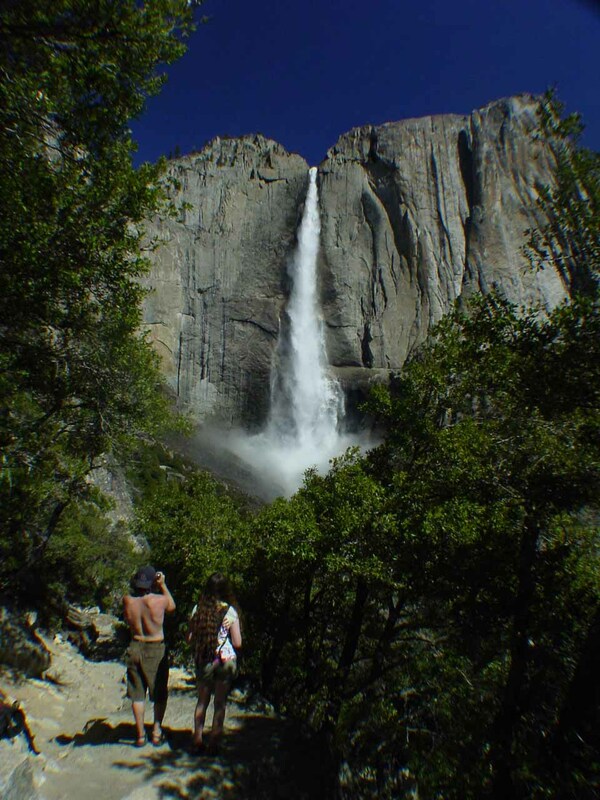 It wasn’t long after the pleasant exchange that we saw the Upper Yosemite Fall. It was quite a sight to see this 1425ft freefalling column of water against a backdrop of a cloudless blue sky. By now, both of us were sweating from the exertion and the heat of the mid-March day. However, the light spray from the falls cooled us down when it blew our way. Mom and I continued a little further to a series of granite steps. By now, it was about 12pm and I had a change of plan when I realized that perhaps the pain of going all the way to the top of Yosemite Falls wasn’t justified when we had more photo stops to do later in the day. Besides, we hadn’t had lunch yet. 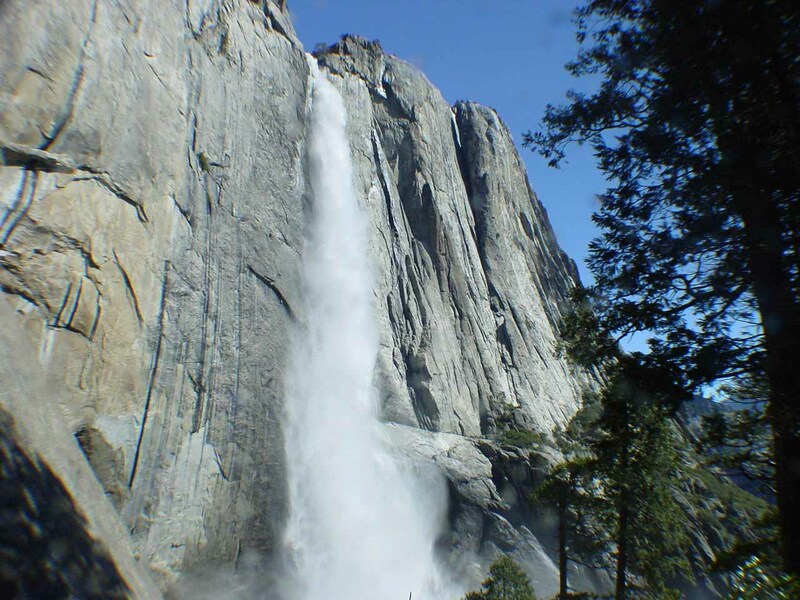 So after photographing the profile of Yosemite Falls, I told Mom we should head back to Curry Village and see if we get a late lunch. 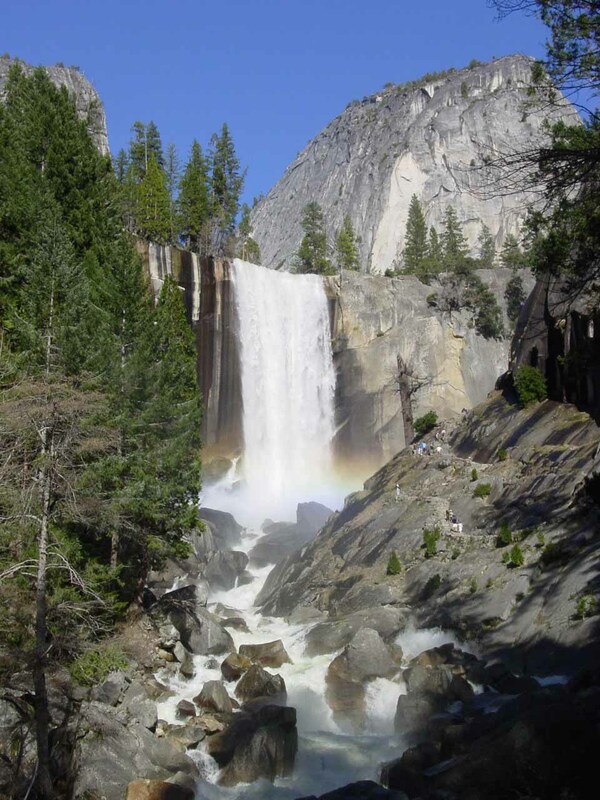 Then, we should see how far we can go on the Vernal Fall and Nevada Fall complex. 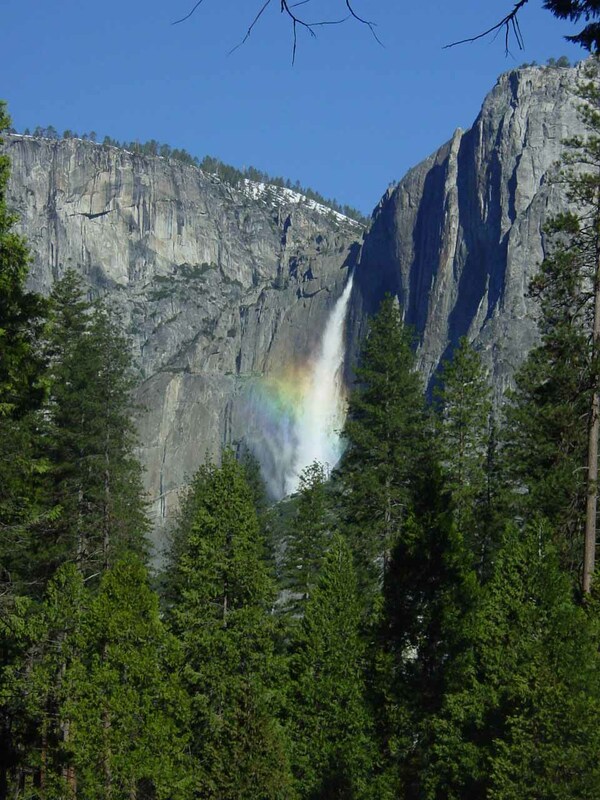 I figured that given the perfect weather, we might get good rainbows at the other waterfalls while we wouldn’t get as much return out of our time and energy getting to the top of Yosemite Falls. It was a judgment call, but I made my decision, and Mom went along with it. 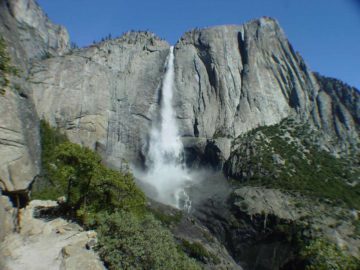 By 4pm – after a quick Curry Village lunch, Mom and I were on the John Muir Trail and made it to the Vernal Fall footbridge in good time. Unfortunately, my nose started bleeding and wouldn’t stop. I guess I was dehydrated again. But I was a bit concerned about how much blood had been lost in this episode. Well it finally stopped bleeding after some ten minutes of constantly swapping tissue paper soaked with blood with fresh new ones. It was getting late in the day and we had to proceed. When we got to the Mist Trail, the trail closure signs were still up. This was typical since there’s usually ice and falling icicles on the trail throughout the winter and early spring. However, we saw heaps of people just jump the sign and kept going. Since we were short on time and there was clearly no ice, we took a chance and followed these people. 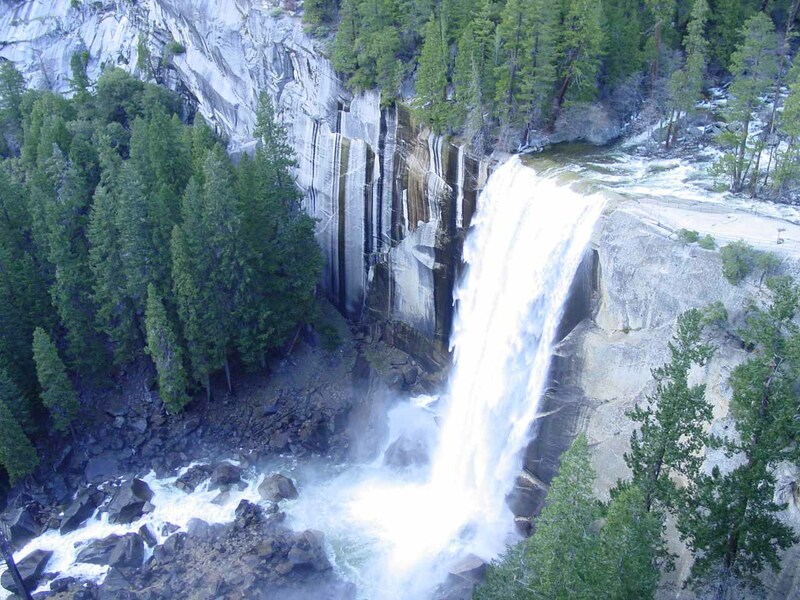 Soon afterwards, we took some photos of Vernal Fall from the Lady Franklin Rock. My hunch about rainbows was spot on. Because as we looked up the Merced River, there was the glowing collection of colors floating before the base of the waterfall. 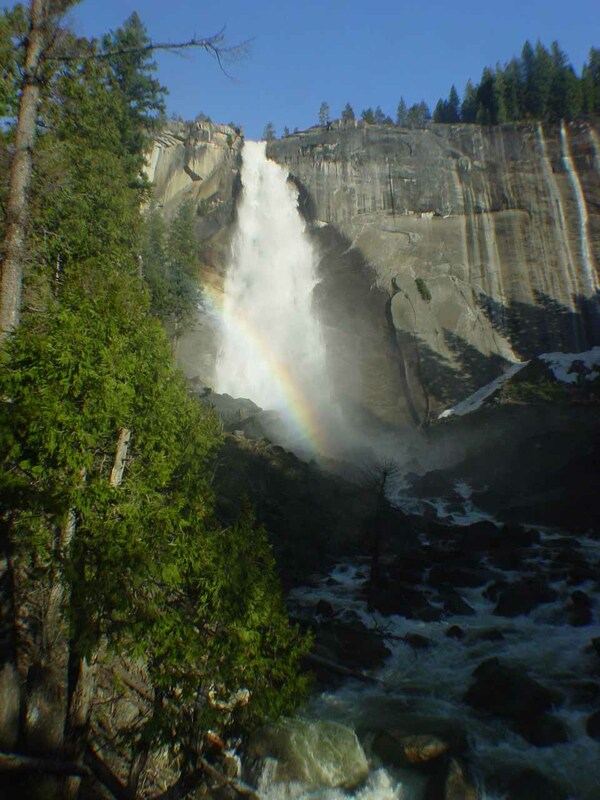 When we continued on the Mist Trail, the rainbow became even larger. The mist wasn’t so bad that we needed ponchos. As a matter of fact, we just kept hiking while enjoying the light mist and rainbows before the massive waterfall. There was even one point when we saw a full rainbow before the waterfall, which was quite a treat. 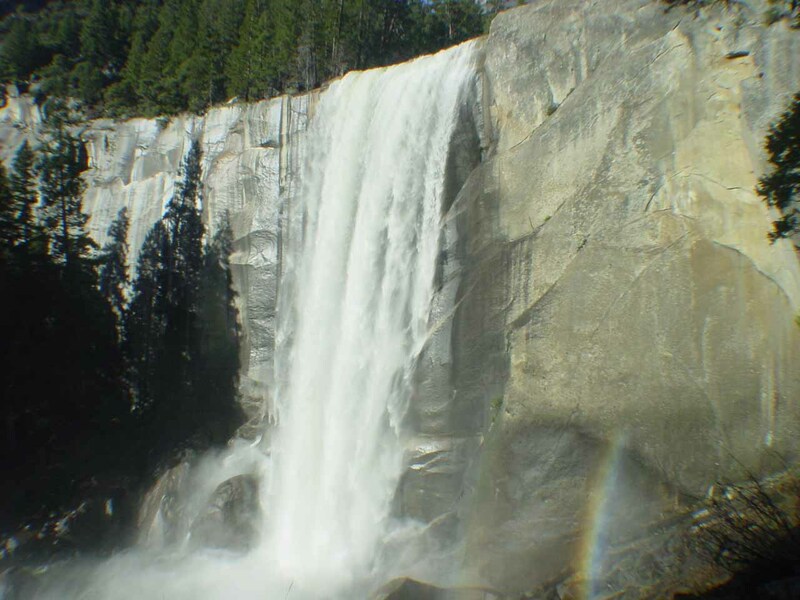 As we continued onwards to the end of the Mist Trail, the rainbow persisted, but it now started to shrink and move off to the side of the waterfall. 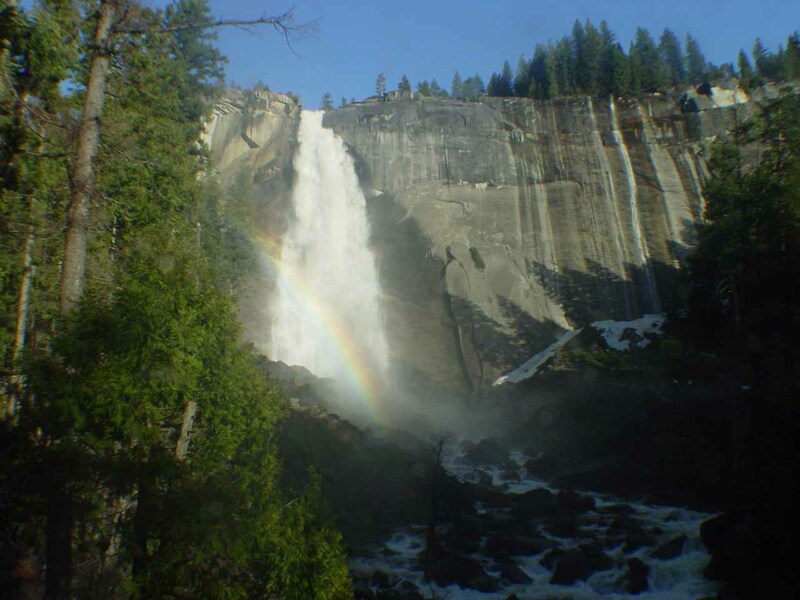 Knowing that our rainbow experience was over for this waterfall, we quickened our pace. 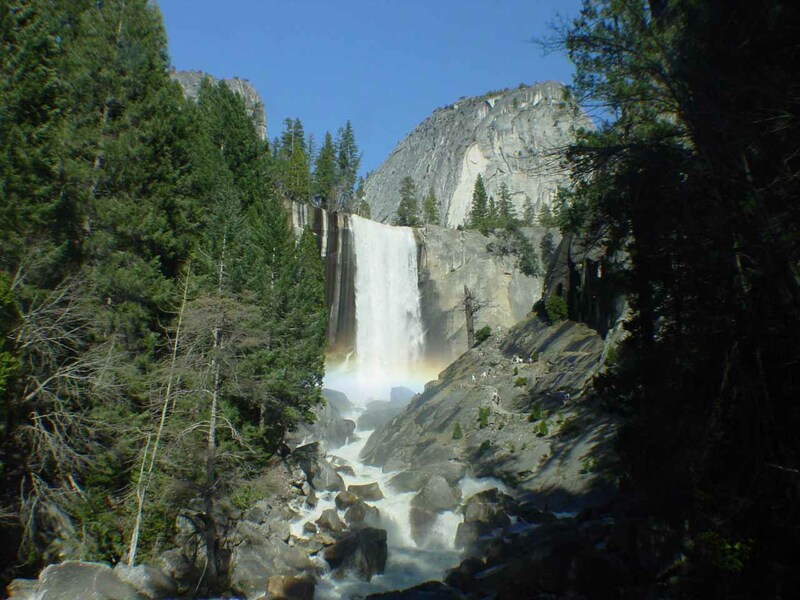 It wasn’t long before we got to the top of Vernal Fall, and then continued towards Nevada Fall along the Mist Trail. The light of the day was continuing to get more orange while the shadows continued to get longer. 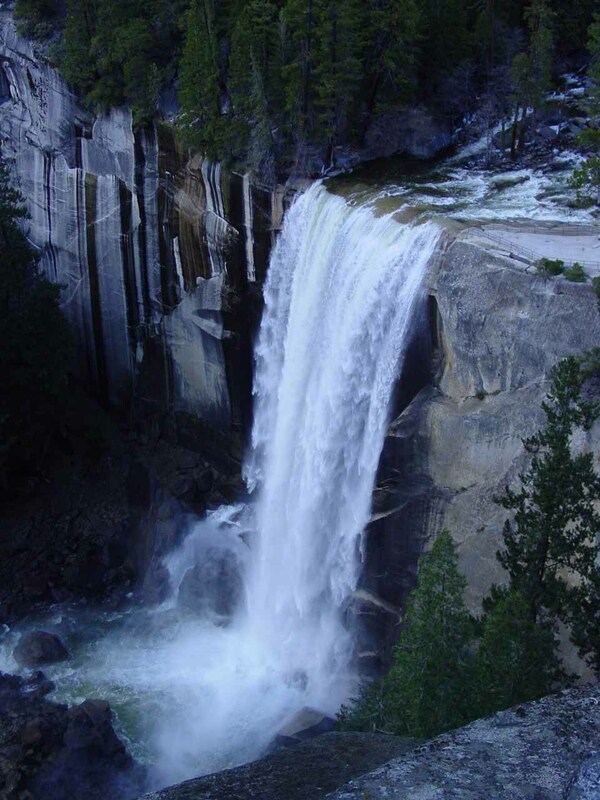 I was in search of a view of Nevada Fall that I saw on one of my Ansel Adams portraits. 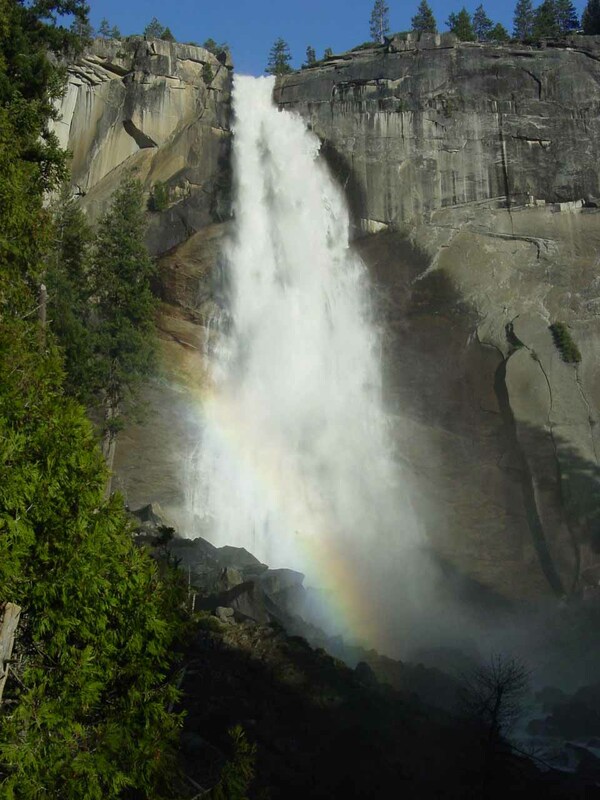 It was basically in front of the waterfall with a rainbow at its base. I had missed this view on all my previous tries in this area so I was determined to be successful today. Minutes before the Mist Trail went from light forest to more granite steps, we followed the treeline to an informal spur that led to a rocky outcrop. 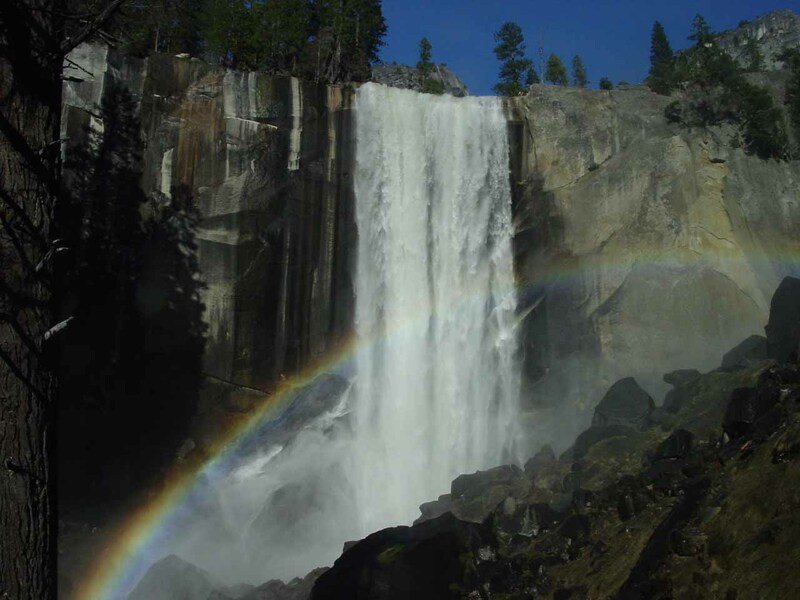 Being careful not to get too close to the edge of this natural platform, we looked before us and saw an incredible sight of Nevada Fall with a long rainbow before it! Yes, this was what I was looking for! Mom delighted in the sight of yet another rainbow. After taking heaps of more photos, it was well past 4:30pm, and daylight was fading fast. So we headed back but decided to take the longer John Muir Trail instead of the Mist Trail. Not far from where we rejoined the John Muir Trail after a brief climb from the Silver Apron area, we saw a nice overlook that looked down upon the entirety of Vernal Fall. It was yet another viewpoint that I had missed in all my previous trips, and we finally got to see this very satisfying view. It was too bad everything was in shadow at the time, but we did snap a few photographs before we had to get back to our Upper Pines Camp. There were still some sections of snow in the areas that seemed to be under shadow all day long at some of the switchbacks. This slowed us down a little, but we were still able to get by without a problem with our hiking sticks and decent hiking boots. Darkness had fallen upon us by the time the John Muir Trail rejoined the spur to the Mist Trail. I had a tiny CMG Reactor LED flashlight as well as a Princeton Vor-Tec headlamp in my pack. Mom carried the flashlight, while I had the headlamp. We continued on in the darkness with the lights and with our eyes pretty well adjusted to the low lighting conditions. However, it wasn’t long before the trail started to seem unfamiliar. By now, we had probably walked at least twenty minutes since the trail junction. I knew the Vernal Fall footbridge couldn’t have been that far away so both of us stopped and turned around. After about ten minutes of anxious hiking, we finally saw the junction that we missed – which was very easy to do in the darkness. 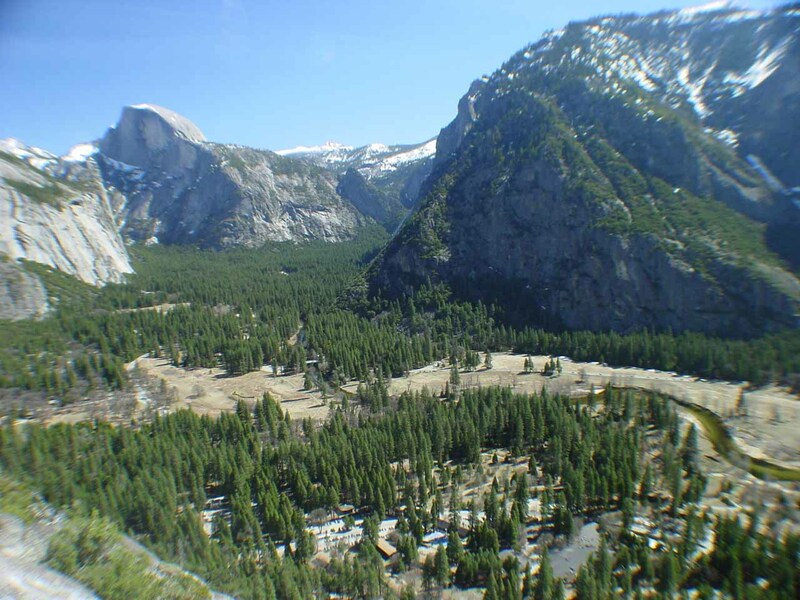 Technically, we could’ve kept going and followed the west banks of the Merced River, but we wanted to hike in more familiar grounds and that meant following the JMT along the east banks of the river. And so we found the Vernal Fall footbridge, kept going, and finally made it back to the Upper Pines Campground by 7pm. After returning to Curry Village to shower and have their delicious pizza, we returned to camp. Despite the little bit of drama at the end of the day, we were quite satisfied with the photos and the scenery we obtained.